The Dubspot team is at The NAMM Show this week in an effort to bring you the latest news on music production, DJing, sound design, and technology from manufacturers and inventors who’ve come to present their latest products to the public. Upon our arrival we eagerly ran from booth to booth, checking out new products from companies such as Moog Music, Akai, Arturia, Korg, Keith McMillen, Smithson Martin, Eowave, Teenage Engineering, Rane, Allen & Heath, and Pioneer. This was no easy feat at a convention that tops 100,000 visitors annually at the Anaheim, CA Convention Center. Moog Music were the first to steal our hearts this year with a tiny, affordable, analog synthesizer called Minitaur. It’s a monophonic synth based on their classic Tarus bass pedals that boasts USB / MIDI connectivity, one knob per function and very small footprint. At $679 ($599 street) it’s less expensive than any other synth that Moog has ever produced. What really matters, though, is the sound. We couldn’t wait to hear it in person and the Minitaur lives up to the Moog name with thick bass sounds and instant gratification of sound design with each knob at your disposal. A spokesperson from Moog told us that they will go into production next month and we can’t wait to get our hands on one. Stay tuned for an in-depth look at the Minitaur from Dubspot in the very near future! For a third year in a row the small team of Teenage Engineering captured the attention of electronic music enthusiasts with their incredibly small yet expressive OP-1 instrument. Once called “the most anticipated synthesizer in the history of mankind,” the OP-1 released to the public early last year and has enjoyed success from those who were able to get their hands on one. 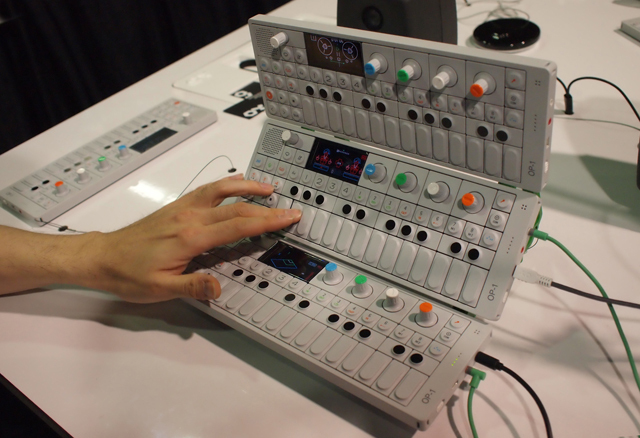 As 2011 came to a close the OP-1 became more available and we wondered what Teenage Engineering could possible offer at NAMM 2012 that would live up to the previous years? How about an OS update that offers many radical new features that their fan base has been asking for? The new OP-1 OS update includes a new sequencer (called Finger), MIDI LFO, a new drum synthesizer and an old school video game to help you pass the time with this gorgeous device. In addition to these new features the new OS also allows the OP-1 to work as a control surface for Reason (v 6.0.2 or higher). While the OP-1 continues to impress us, the company behind the instrument is really showing dedication to its fans with these updates. The QuNeo “3-D multi-touch pad controller” has been on our radar for a few months now, with Dubspot artists such as Thavius Beck endorsing the product from SoftStep creator Keith McMillen. The QuNeo differs from other controllers on the market by way of pads that can read pressure, velocity, and location when pressed, giving an extra dimension of musical expression. It features 16 square pads that provide 127 levels of Velocity response with X-Y location, 2 rotary sensors, 9 touch sensitive sliders and switches in a low-profile design that will cost a fair $250 (ships in March). It’s also worth mentioning that Keith McMillen is one of the coolest people we met at NAMM. His website has a quote that says he “walks the line between Steve Jobs and Bob Moog,” and we found this to be a fairly accurate statement. His energy and excitement for product development and solving problems is contagious and we found ourselves taken to different dimensions of thought with him. Akai has been teasing an eager fan base for a few weeks now with three new “MPC” branded devices that will integrate a new software package with hardware into a new workflow. The MPC Renaissance and MPC Studio leaked first, each a new controller platform that expands upon the original MPC workflow with enhancements via new software. While they look intriguing, the real excitement came in the form of the MPC Fly – a combination of iPad case with MPC pads and application that re-create the MPC workflow on your iPad. While the product is not yet in final stages for use, Akai has launched a video of the Fly which you can check out below. 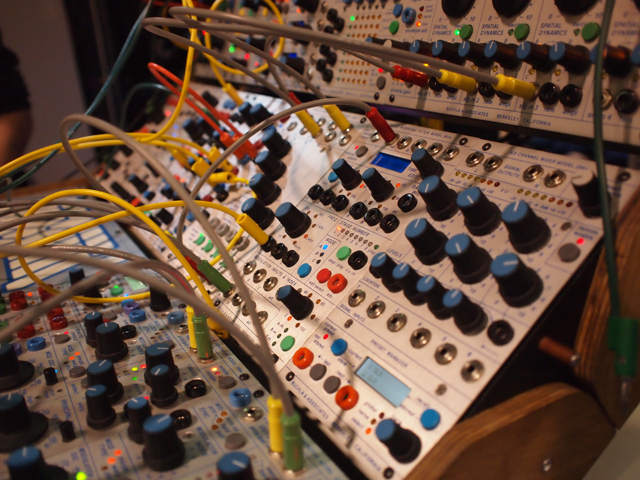 Last but but not least, we made a visit to the Buchla booth to check out the impressive modular analog synthesizers that have been championed by Trent Reznor and Richard Devine. These mad scientists are always hard at work making amazing sounding and visually stunning synths.